When your pet needs care, we’re here to help. Oak Knoll Animal Hospital is staffed by a team of nurturing professionals, committed to the health and wellness of animals in Moline. We are dedicated providers of wellness care, preventative medicine, internal medicine, and more. Stephanie came to Oak Knoll as a client service representative in 2013. After taking leave for a year, she returned to Oak Knoll in 2016, accepting the role of Hospital Manager. She has over 10 years of management experience and over 15 years of experience in customer service. 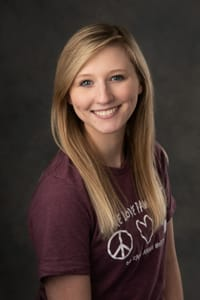 For her, the management role allows her to satisfy several passions in her life; working with animals, client relations, marketing, management and budget planning. She says that she wishes to increase awareness and education on fleas and parasite prevention. Her best advice to new pet owners is to keep them on preventatives year round. Stephanie’s goals for Oak Knoll are to continue to improve the services they currently offer, while expanding to offer new services and accommodate client needs. She says her five year plan is to have a new building and a new parking lot – because she knows it is needed. 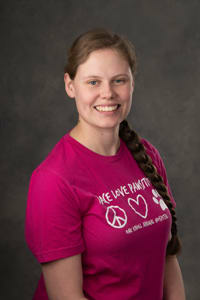 She also hopes to grow community involvement by supporting local efforts and participating in local events. Her downtime is spent with her husband, Adam, and kids, CharlieLynn and Julian. As self-professed nerds, they enjoy board games, crafts and video games. They also enjoy getting together for big family gatherings. They have two cats, Ash Williams and Zeppelin, who keep them entertained. Robyn is a veteran here at Oak Knoll, having been employed since 2006. 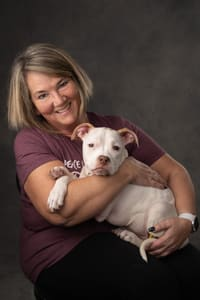 She says the most rewarding aspect of working in this field is helping to save lives, and she enjoys the people that come through our doors just as much as they pets they bring. Anesthesia and sedation methods are things that particularly interest Robyn, and she is proud of her length of employment with our company. Robyn best advice for new pet owners is to make sure that you don’t overfeed them and that they receive proper training. Robyn owns a small hobby farm with her husband DJ and their two kids, Emelia and Nicolas. When she’s not tending to their goats and peacocks, Robyn enjoys getting her nails done. Her vices are Chicken in a Biscuit crackers, wedding cake and online shopping. If she could travel anywhere, she would go to Belize and that if a movie was made about her life, she would be played by Christie Brinkley. Joshua came to us as an intern in the summer of 2017 and we liked him so much we decided to keep him! Josh filled the part-time role of a Veterinary Technician officially in the fall of 2017 and has been going to school to obtain his Veterinary Technician Certificate through BlackHawk College. Josh currently enjoys performing dentals and enjoys how amazing our clients are. He says that he wishes more owners knew just how easy it can be to get fleas or parasites. 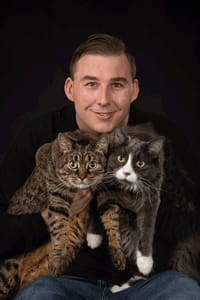 Josh served in the military on the United States Air Force prior to pursuing his career in the veterinary industry. He enjoys reading or spending time with his friends and he has 3 cats; Bob, Katiness and Jasper. Alicia began her Oak Knoll journey in the fall of 2017. 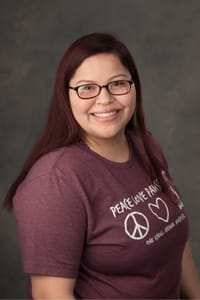 She is currently taking classes for her Veterinary Technician Certificate at St. Petersburg College while she is working part time as a Client Service Representative. She says she enjoys working in this field because she is able to be a part of keeping our patients healthy. Her best advice to new pet owners would be to watch for bad habits, they can develop easily and be very hard to break! When she’s not working, or studying, Alicia enjoys hiking and being outdoors She has a cockapoo named Bella, and two cats, Eliza and Miller. 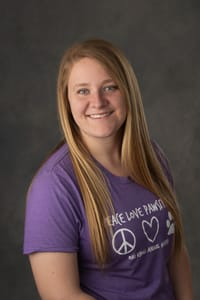 Kelly recently moved to the Quad Cities, and Oak Knoll was lucky to have her join our team. Before she started with us in 2016, she worked at Springbrook Animal Care Center. She states that her favorite part of working in this field is getting to know the patients. She says that her best advice to new pet owners is to do your research and be informed ahead of time. In her free time, Kelly likes to play video games and computer games and read. She says her husband Mark is her biggest fan and she is most proud of graduating college. She enjoys pop music and ice cream and would love to travel to the Florida Keys. 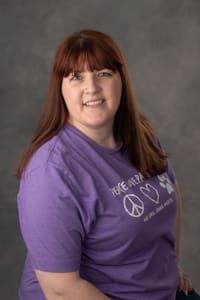 Tracy joined the Oak Knoll family in the summer of 2016. She wanted to pursue a career that would allow her to follow her passion and love of animals. 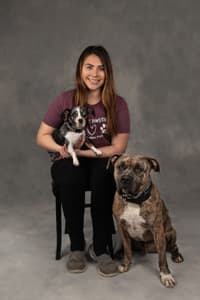 She loves the opportunity this career has given her to build relationships with both our clients and our patients, and she says she wishes more pet owners were aware of the ingredients in their pets' foods. 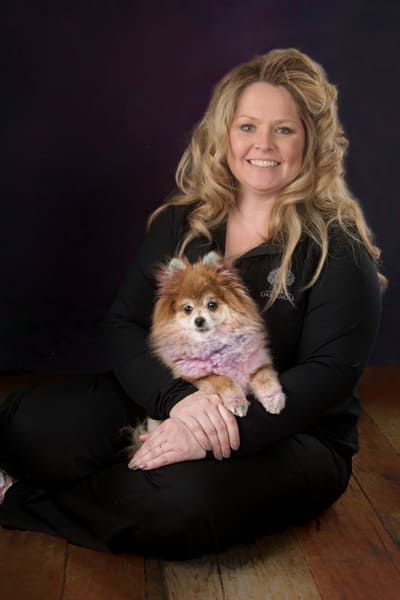 Tracy stays active in her "down time" by riding her bike or attending Zumba classes. She is a self-proclaimed Zumba addict! She says her biggest accomplishment was completing the Indy 500 Mini Marathon - that's 13 miles! When she's not at Zumba, she spends time with her children and grandchildren and even her grandpets!